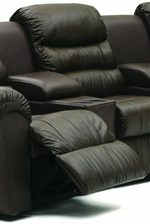 This Five Chair Home Theater Seating provides the ultimate versatility in function, style, and comfort. Perfect for your home theater or den, this seating configuration provides two reclining end seats, one reclining middle seat, and two stationary seats. 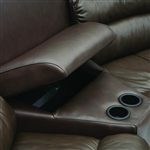 Two forty-five degree wedges have built-in cup holders and storage areas that are perfect for remotes, DVDs, blankets, or other items that get misplaced in a den or living room. 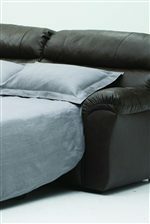 Oversized pillow arms, deep seats, and cushioned leg rests are the ultimate in comfort. 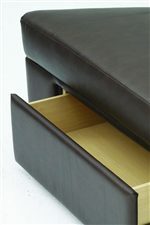 Exterior release handles are easy to use and are wrapped in matching fabric or leather. Perfect for kicking up your feet to relax in front of the TV or while watching a movie, this reclining home theater sofa is sure to become the favorite seat in your house. The casual style is relaxed and inviting, and the comfort cannot be beat. Available in over 300 leathers and fabrics, you can create a look that is completely custom and truly unique. The Durant 5 Chair Home Theatre Seating by Palliser at Olinde's Furniture in the Baton Rouge and Lafayette, Louisiana area. Product availability may vary. Contact us for the most current availability on this product.